It's been a while since I had to get up at 4 a.m. for a bike race... I don't really like getting up at 4 a.m. , but after a mug of coffee and some chocolate covered espresso beans (Thanks Jocelyn) I was fully awake and we were about halfway to Elkton, MD. I haven't done this race for a few years, but this is always a good one to go to. The trails are fun and twisty, the turnout is usually pretty high which draws some good competition, and it is usually hot and humid which would be the case for the day's race. After the 2.5 hour drive listening to a combination of Otep and Stretch Arm Strong Jocelyn and I got to the race with about 2 hours to spare to the start. I went over the map I printed out for her and my parents to locate me throughout the race and was relieved that it seemed fairly simple for once (little did I know most of the roads were unaccessible that appeared on the map). After an easy warm up I rolled up to the starting line and grabbed a spot up front and waited anxiously for go time. The start was fast. 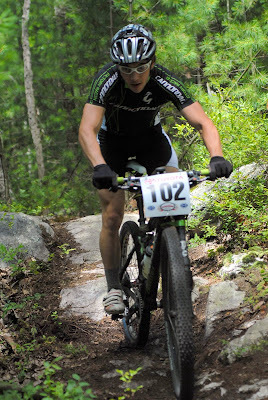 Instead of leading this one out, I sat in around 5th place for the first couple of miles before sprinting to the front in order to get into the singletrack first. I was feeling great pushing the big ring, railing turns, and feeling comfortable, but was unable to gain any time on the other racers on this mostly rolling and smooth course. I soon zoned out and blew a turn losing about 5 positions which I would eventually gain back as I made my way into 2nd place behind one of the twins. From this point on I would remain in a twin and Chris Beck sandwhich for the next 10 miles or so until Chris laid down an attack and I followed dropping both twins. I took over the lead in the singletrack and Chris followed close behind. We kept the pace high and made every effort to keep on gaining time on the rest of the pack. The second half of the course went by in a flash and the only thing I remember was how much it hurt. By the end Chris was still with me as we came out onto the final stretch of the course which was a wide open section of dirt road, pavement, and grass. We both prepared for a sprint finish and left every ounce of energy behind as we battled for the top spot. In the end I finished 2nd just a few seconds behind and about 3 minutes up on the twins. 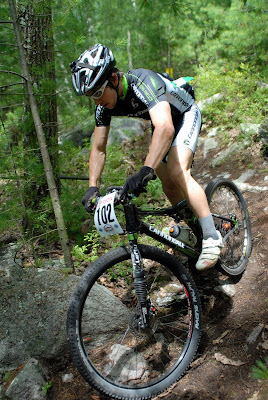 It was a great race, but I really can't wait for this upcoming weekend at Michaux. Their summer race has been my favorite since I've started racing.